These are lovely Carol! And the sun is too much for me these days - do quick sketches from the car or from memory. Absolutely love the horses and the water and the reflections Carol! And our mountain! Beautiful. 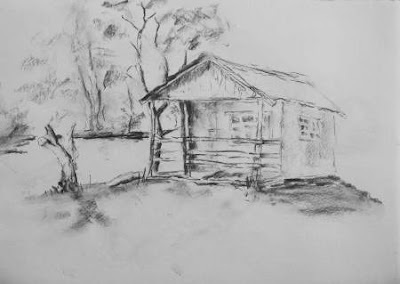 The charcoal sketch is charming and would make a great painting. Are you going to use it as the basis for a painting? Hi Carol, you are really doing so well with your Plein Air painting! Perhaps you will do some larger paintings from these? Hi Maree. Thank you. Yes, I cover myself with block out before going out and then wear a floppy hat and try to keep in the shade! My skin has suffered very badly from over exposure to the sun! Never tried the car though! Hi Jean. Thank you and yes I was hoping to use it for a painting. This will open a whole new avenue for me - if it works! Thanks Dianne. I will definately try to. I am finding it difficult to adapt from studio to outside and back again but I am sure it just takes practice. You have really developed your skills as an artist since we first starting blogging with each other. You have a wonderful eye and wonderful skills. These are truly lovely! Thank you so much Kath. I love the way you are so positive and inspirational!